An impressive Moog filter emulation for a simply bargainous price, though it could do with more modulation options. Smooth filter sweep. Nice pentode saturation. Bias for fine tuning valve sound. Slick interface. Bargain price. No modulation. No self-oscillation at high resonance. The original Moog Modular synth introduced to the world a classic filter design that still stands as definitive of its type today. Dublin-based soundware producer AudioThing has made the move into effects by packaging its take on Moog's renowned 'ladder' circuit into a budget-priced VST/AU plugin, with the addition of a valve drive section for extra flavour. 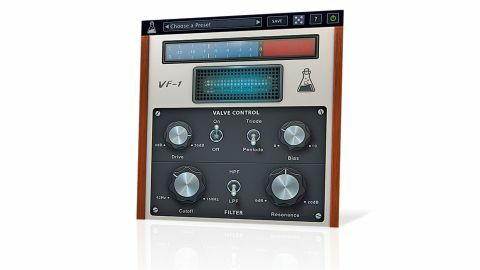 ValveFilter VF-1's main features are a switchable two-mode 24dB/octave filter (high-pass and low- pass) with Cutoff (42Hz-16kHz) and Resonance (0-20dB) controls. The valve section (modelled on a vintage Telefunken ECC83) adds Drive (0-36dB), two valve operating modes (Triode and Pentode), and valve Bias. There are nine presets onboard, including the default reset, and you can add your current settings to the list by hitting Save at the top of the interface and giving your preset a name. Other options on the preset bar include a simple preset manager and access to the online manual (both via the ? button), and a randomise function (click the die icon to randomise all settings). Finally, you get output level meters and a dynamic valve graphic that glows more intensely in reaction to signal level. "While our favourite mode is Pentode - it's less fizzy and richer in the low frequencies - we found both settings great for adding subtle saturation"
Starting with the drive circuit, both Pentode and Triode modes produce odd and even harmonics, but with a different balance ratio - odds are more dominant in Triode mode, while Pentode mode has a more dominant third harmonic and much sharper tail-off of harmonics. Overall, the amplitude of the harmonics generated is lower in Pentode mode. As you'd expect based on these observations, Triode mode is the more audible, but both can get pretty edgy; and while our favourite mode is Pentode - it's less fizzy and richer in the low frequencies - we found both settings great for adding subtle saturation. The filter circuit definitely has that essential Moog character, mostly thanks to the smooth response as the cutoff is swept. Unlike the original, though, AudioThing's design includes some level compensation, so that increasing the resonance doesn't result in a drop in level - very useful. The filter doesn't self-oscillate like the real thing, though. Overall, these factors make it feel different to an actual Moog; it's easier to tame, but it can lack that sense of being on the verge of going gloriously out of control. To be fair, AudioThing don't market VF-1 as a hyper- accurate Moog filter recreation, just that it is "modelled after a classic ladder filter". Moog comparisons aside, then, it does sound very good in its own right and is notably rich in the lower mid frequencies, making it a particularly fine option for automated filter rises across beats, basses and whole mixes. Used in conjunction with the punchy valve drive, it's adept at reshaping sounds of all kinds, and with the filter following the drive section, you can use the low-pass mode to curtail unwanted nastiness. If we could make a suggestion, though, the filter section would benefit immensely from having an envelope follower or MIDI-triggered envelope built in - that would increase its flexibility considerably. While the plugin feels less refined and rather feature-light alongside top-of-the-line competition such as Universal Audio's Moog Multimode Filter, you do have to factor in that very attractive asking price, of course. For a filter of this sonic quality, it's a true bargain.